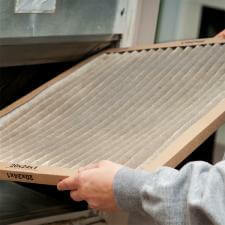 Checking your furnace filter should be a monthly routine for every home owner, however, it can often be overlooked. If it's been a while since you've thought about your HVAC filter, here are some reasons why you should put it on top of your priority list. The first side effect of a dirty filter is poor air flow. It's your filter's job to trap dust and debris to keep it from being released into your home. After a month of use, these particles have accumulated to a point where air can no longer pass through the filter. This results in your heating and cooling system operating very inefficiently. When an HVAC system short cycles, it means it is turning on and off frequently in order to maintain the ideal comfort of your home. While you may not notice this occurring, your system is being overworked and overheated. This can cause long-term damage to your system and also take a toll on your energy bill. When you neglect to change or clean your furnace filter for a long period of time, it is likely that your system will become so overworked that it will break down. Unfortunately this will most likely happen during the coldest or hottest days of the year. Prevent getting stranded during extreme temperatures and keep this very easy task on your monthly routine. Already experiencing a system breakdown? Request service today!